Recently some colleagues from the Chinese Culture Center and I visited Fong Chung-ray in Walnut Creek, California. While the sweltering outdoor temperature read 101 degrees Fahrenheit, Fong entertained us in the coolness of his studio with stories of his life as an artist and the trajectory his art took that made him one of the most prominent figures of modern Chinese art. 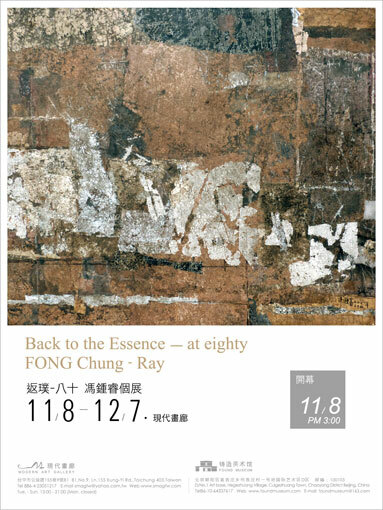 In spite of the hot weather that day, Fong at 79 years of age, exulted harmony and serenity as he spoke -- temperament that can found reflected in many of his paintings. His studio housed many paintings that were created within the last few years. This vast number of new artwork is a testimony of Fong's ceaseless need to create art and of his constant search for artistic expressions that bring satisfaction to his creativity. His long career began in Taiwan and continued when he immigrated with his family to San Francisco in 1975. Born in 1934 in Henan, China, Fong Chung-Ray spent his childhood years in periods of turmoil marked first by the Japanese invasion of China and later by the war between the Nationalists and the Communists. In 1949, Fong joined the Nationalist Army as a cadet and left China for Taiwan with a group of young friends. In 1952, he enrolled in the Art Department of the Political Staff College in Taipei (renamed Political Warfare College in 1970) and began studying art and painting from nature. However, Fong soon found that painting realistic depictions from nature was not satisfying; he felt the need to create something from within rather than from without. 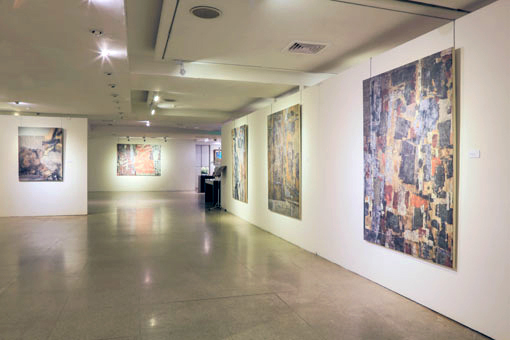 This belief further developed after he became acquainted with Western abstract art from books and magazines he encountered at the library, and from reproductions he saw at the U.S. Information Services Center in Taipei. Fong Chung-Ray's importance in the history of Chinese modernism lies in his relentless pursuit of a new visual language that combines Chinese and Western sensibilities in abstract forms. Unlike many other Chinese artists in the 1950s and 1960s who continued the traditional ink-and-brush renditions of landscapes and birds-and-flowers imbued with personal variations, Fong together with members of the "Four Seas Art Association" and later the "Fifth Moon Painting Society," sought to introduce a new visual vocabulary that focused on revelation rather than representation. In Fong's paintings, thoughts and feelings are abstracted and expressed through layers of paints, shapes and lines. Not content with what he saw at the time in Taiwan, Fong abandoned realistic depictions of the material world and embraced abstract art to convey his inner world. 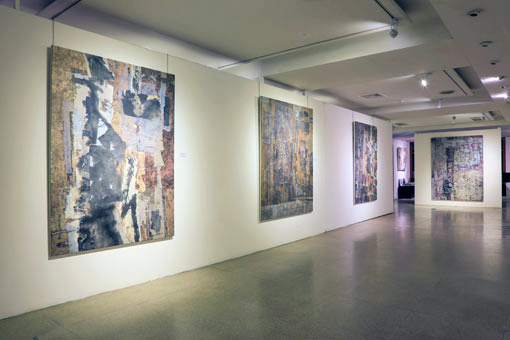 The paintings in this exhibition are recent works created by the artist in the last two to three years. We can safely say that this body of work embodies Fong's mature style. Chinese ink, acrylic, and collage are now combined to produce a rich textured effect -- the materials themselves thus create perspective and depth. Gestural Chinese calligraphic strokes interlace with non-representational elements to create vibrant images that invite the viewer to linger his gaze upon the surface of the painting and to explore what lies beneath. Never afraid of borrowing from tradition but freely keeping the spirit of abstraction, Fong frequently uses Chinese calligraphy in his paintings. It has been pointed out repeatedly by scholars and artists that Chinese calligraphy in itself is a high form of abstract art. Who can refute this statement when looking at the "crazy" draft script (kuang caoshu) of countless Chinese calligraphers throughout the long history of Chinese art? Fong's calligraphy can be at times fluid and elegant when drawn with a brush, and at times blunt and pictographical when etched with a sharp tool. The calligraphy can be poems from ancient times or excerpts from Buddhist sutras. Combined with color gradations and textured layers, Fong successfully blends a much beloved traditional Chinese art form, that of calligraphy, with the spirit of Western abstraction. His later paintings also feature a technique Fong started using in the 1990s. He would apply acrylic onto thin sheets of plastic, these sheets would be crumbled to create unpredictable patterns, and these patterns in turn are transferred onto the paper or canvas. The patterns often produce a rhythmic vitality in its purest abstract form. From a distance, the subtle hues of brown, blue, green and violet juxtaposes serenity with energy. In the grand context of Chinese modernist art, Fong Chung-ray undeniably has an essential role in shaping its direction. One can find in many younger Chinese artists, who dabble in combining traditional Chinese art forms with Western techniques, noticeable influence from Fong, whether they like to admit it or not. Having made his mark in the continuum of contemporary Chinese painting, Fong Chung-ray's spirit of experimentation continues to flourish. We look forward to his next body of creative work.